Nearly 400,000 renter households in the Washington DC region—about half of all renters—are cost burdened, spending 30 percent or more of their income on housing costs. For many individuals and families paying high housing costs can mean there is too little for other essentials, such as food and health care. In the Washington DC area, more than 12,000 homeless individuals were identified in this year’s point-in-time homelessness count, though we know the number of people without stable housing is much higher. 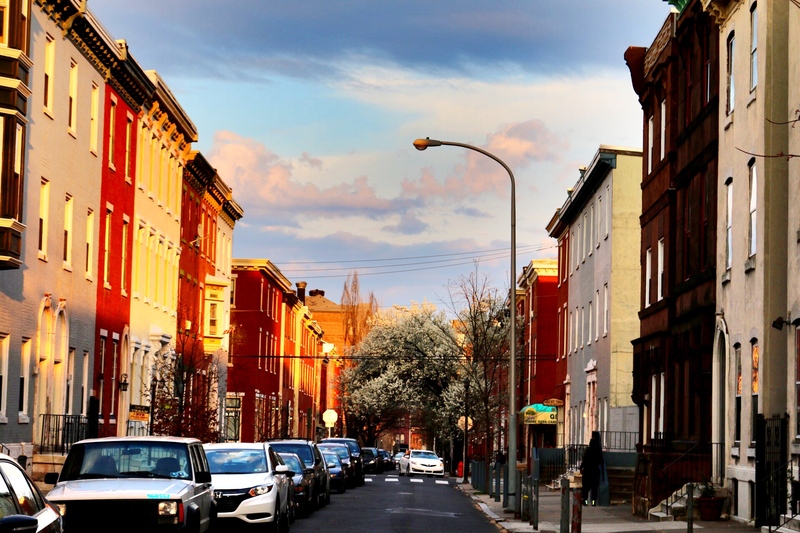 Despite the efforts of countless housing advocates, non-profits, and local governments, the housing affordability challenges in the DC region continue to grow. What can local jurisdictions do to stem the rising affordability challenges? Housing is a growing concern in the region. 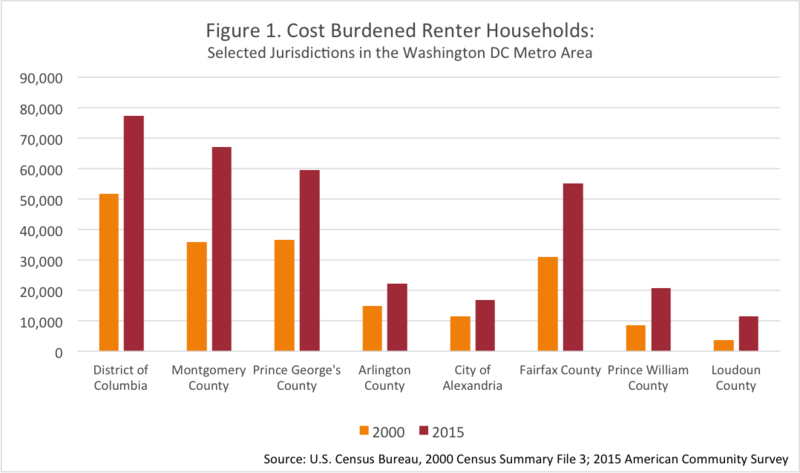 According to data from the U.S. Census Bureau, in 2000, about 220,000 renter households in the Washington DC metropolitan area were cost burdened. In 2015, that number had grown to about 380,000, an increase of 160,000 households. In 2000, 33.2 percent of renters were cost burdened. In 2015, that share was 48.5 percent. The overall number of cost burdened renters has increased in jurisdictions throughout the region. For example, there were about 25,600 more cost burdened renters in DC in 2015 than there were in 2000. In Montgomery County, the number of cost burden renters grew by more than 31,000 over the 15-year period between 2000 and 2015. Fairfax County added 24,200 new cost burdened renter households over the same period. These increases are not because local jurisdictions have ignored the problem. Just in the last few years, DC has dedicated $100 million to its Housing Production Trust Fund. Montgomery County has increased efforts to use public land for affordable housing. The City of Alexandria continues to look for opportunities to partner with developers to expand mixed-income housing. Fairfax County has made housing affordability a key component of its Strategic Plan to Facilitate Economic Success. Arlington County is working to adopt at Notice of Funding Availability (NOFA) process to more efficiently and effectively allocate local housing resources. But, as the cost burden numbers show, it hasn’t been enough. And things probably are not going to get easer in 2017. Even without specific affordable housing proposals, the new Presidential administration could weaken key Federal programs that local jurisdictions have come to count on for the production and preservation of housing affordable to lower-income individuals and families. Tax reform. No specific proposals have been discussed by the incoming Trump administration related to the Low-Income Housing Tax Credit (LIHTC) program. It seems very unlikely that the credit itself will be eliminated since there is generally broad bipartisan support for the program. However, there has been a lot of talk about the likelihood of tax reform under the new Trump administration. Some affordable housing finance experts have suggested that there could be “substantial” indirect effects of proposed tax reforms on the LIHTC, making the tax credit less valuable to investors. Reduced capacity of the LIHTC could mean a growing need for local resources to fill financing gaps and to make projects feasible. Cuts in Nondefense Spending. President-elect Trump has indicated that he intends to cut nondefense spending, at one time saying he wanted cuts of one percent every year. This would mean cuts to key HUD programs that serve some of the lowest-income and most vulnerable individuals and families in our communities—programs like the Housing Choice Voucher Program and CDBG and HOME. Historically a target of cuts, these programs could be at significant risk under a President who has indicated little interest in supporting HUD programs. Even now, federal housing programs currently serve only about a quarter of eligible households. Reductions in federal funding would means that local jurisdictions will lose critical resources to support a wide range of housing and community development programs and the losses would disproportionately impact the lowest-income and potentially the most vulnerable households. Rising housing challenges and declining federal resources are not new phenomena; local jurisdictions have been taking on increasingly active roles in housing policies and funding for decades. However, in 2017, the role for local action on housing will be even more critical in our region. What can local jurisdictions to do differently to move the needle? Make the case. Throughout our communities we need to continue to make the case for why housing is important. And there is not just one argument. Whether it’s because increasing housing supply is good for the local economy. Or that education and health outcomes are better for families with access to safe and affordable housing. Or that poor children who live in higher-opportunity neighborhoods go on to make more money—any pay more taxes—than those left behind. Document the need. At the local level, it is important not only to quantify housing needs in the community, but also to relate those numbers to actual people. Combining hard data with descriptions of hypothetical—or real—individuals and families is important for demonstrating the need. Explain how housing finance works. Make sure that the community understands why government is necessary when it comes to building housing affordable to lower-income households. Tools like the Urban Institute’s affordable housing simulator can help show in black and white that gap that often needs to be filled by public resources. Prioritize housing. Public resources are limited and local jurisdictions have competing demands on those resources. In general, however, local communities have not been explicit about prioritizing housing, and then about prioritizing particular goals within housing programs and policies. Prioritization—linked to specified and dedicated funding sources—seems especially important to having an impact. Innovate on the funding side. To meet housing needs when federal resources are on the decline, it is going to be necessary to identify new sources of funding. Local jurisdictions need to commit to looking for innovative funding sources and partners. 1 Comment/in HAND News, HAND Thought Leadership /by H.A.N.D. As mentioned above, providing affordable housing has benefits for entire communities. And, enormous amounts of money are required to produce even a few housing units. So housing advocates seek to convince taxpayers and/or foundations that demand-based and/or supply-based subsidies are a worthy object of large amounts of public and private funds. providing affordable housing has significant benefits for an entire community. However, another approach has proved successful where it has been tried. The current property tax structure inflates housing costs in two ways. First, it penalizes the private construction, improvement and maintenance of housing by imposing a tax based on the assessed value of buildings. And that tax penalty is imposed each and every year that an improvement (such as a new roof or HVAC system) adds value to the property. Thus, over time, the imposition of a 1% or 2% property tax can have the economic impact of a 10% to 20% one-time sales tax on construction labor and material. This is a substantial barrier to housing affordability. Second, it allows private landowners to appropriate the lion’s share of publicly-created land values. Thus, if a community uses tax dollars to improve schools, transportation, or public safety, for every $100 of publicly-created land value, the landowners must pay only $1 or $2 per year. Using the same analysis as above, the net present value of these taxes is between $10 and $20. Thus, 80% to 90% of publicly-created land values end up as windfall profits for landowners. This is fuel for land speculation — a parasitic activity that produces nothing of value but which inflates the price of land — leading to periodic real estate booms and busts. Both booms and busts are harmful to the economy generally and to those in need of affordable housing in particular. The lower tax on buildings makes buildings cheaper to construct, improve and maintain. When these activities become more affordable, more activity occurs, employing more people. And employment one of the best (and often overlooked) solutions to problems of housing affordability. Surprisingly, the higher tax on publicly-created land values helps keep land prices in check. By reducing the profits from land speculation, this tax reduces the speculative demand for land and thereby helps lower its price. This tax shift alone, will not solve the housing affordability problem, but it will help. And, failing to do this will render other approaches less effective. So lets learn from the jurisdictions that have been successful with this tax shift and make housing more affordable while increasing employment opportunities as well.